In this project we are going to make a Buck Converter Circuit using Arduino and N-Channel MOSFET with a maximum current capacity of 6 amps. We are going to step down 12v DC to any value between 0 and 10v DC. We can control the output voltage value by rotating the potentiometer. A buck converter is a DC to DC converter, which steps down DC voltage. It is just like a transformer with one difference; whereas transformer steps down AC voltage buck converter steps down DC voltage. Efficiency of buck converter is lower than a transformer. Key components of buck converter are mosfet; either n-channel or p-channel and high frequency Square Pulse Generator (either a timer IC or microcontroller). 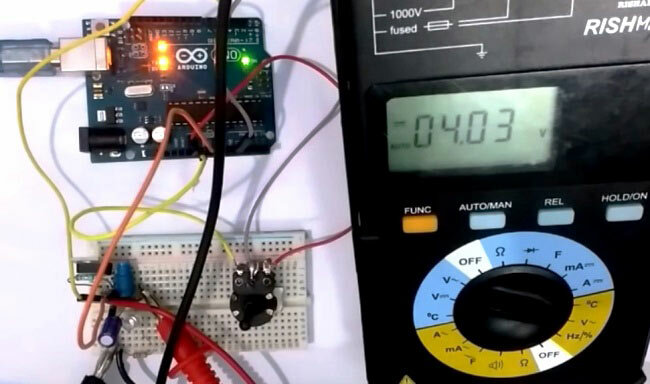 Arduino is used here as Pulse Generator, a 555 Timer IC can also be used for this purpose. Here we have demonstrated this Buck converter by controlling DC-Motor speed with Potentiometer, also tested the voltage using Multimeter. Check the Video at the end of this article. Make connections as shown in circuit diagram above for DC-DC Buck Converter. Connect one terminal of inductor to source of mosfet, and another to LED in series with 1k resistor. Load is connected in parallel to this arrangement. Connect 10k resistor between gate and source. Connect capacitor in parallel to load. Connect positive terminal of battery to drain and negative to capacitor’s negative terminal. Connect p terminal of diode to negative of battery and n terminal directly to source. GND pin of Arduino goes to source of mosfet. Do connect it there or circuit will not work. Connect potentiometer’s extreme terminals to 5v pin and GND pin of Arduino respectively. Whereas wiper terminal to analog pin A1. For high speed switching of the output voltage. To provide high current with less dissipation of heat. Inductor is used to control voltage spikes which can damage mosfet. Inductor stores energy when mosfet is on and releases this stored energy when mosfet is off. Since frequency is very high, value of inductance required for this purpose is very low (around 100uH). Schottky diode completes the loop of current when mosfet is switched off and thus ensuring smooth supply of current to load. Apart from this, schottky diode dissipates very low heat and work fine at higher frequency than regular diodes. Brightness of LED indicates the step down voltage across load. As we rotate the Potentiometer, brightness of LED varies. When wiper terminal of potentiometer is thrown off to different position, voltage between it and ground changes which in turn changes the analog value received by pin A1 of arduino. This new value is then mapped between 0 and 255 and then given to pin 6 of Arduino for PWM. ** Capacitor smooths out voltage given to load. Why resistor between gate and source? Even slightest noise at gate of MOSFET can turn it on, hence to prevent this from happening it is always advised to connect high value resistor between gate and source. Complete Arduino code, for generating high frequency pulses, is given in the code section below. Code is simple and self-explanatory, so here we have explained only few parts of code. Variable w is assigned the mapped value which is between 0 and 255. Here the ADC values of Arduino are mapped to 2 to 255 using map function in Arduino. TCCR0B = TCCR0B & B11111000 | B00000001;// change frequency of pwm to 65 KHZ approx. When circuit is switched on, mosfet switches on and off with a frequency of 65 khz. This causes inductor to store energy when mosfet is on and then give this stored energy to load when mosfet switches off. Since this happens at very high frequency, we get an average value of pulsed output voltage depending on the position of wiper terminal of potentiometer with respect to 5v terminal. And as this voltage between wiper terminal and ground increases so does the mapped value on pwm pin no. 6 of Arduino. And since MOSFET is a voltage dependent device, this pwm voltage ultimately determines the voltage across load. Here we have demonstrated this Buck converter by rotating a DC-Motor and on Multimeter, check the Video below. We have controlled the speed of motor with Potentiometer and controlled the brightness of LED with Potentiometer. If I want to convert 24 v dc to lower DC voltage what should I do? Can u add a feedback to the code so that the output voltage become stable with changing load? I m sorry but this is not dc-dc converter is driver with pwm.